California Gov. Jerry Brown's 2016 veto of wildfire-related bill is facing new scrutiny in the wake of the deadliest, most destructive week of fires in state history. The measure would have required the state government's public utility commission to work with municipalities to ensure that energy companies do all they can to prevent fires in high-risk areas. The governor's critics disagree, especially now that a power line is suspected to have caused the Camp Fire, which wiped out the small town of Paradise, Calif. in the worst fire in state history. Trump's trip revived last weekend's heated debate between himself and Brown over the root cause of the fires—whether lack of forest management or climate change is mostly to blame. Brown at a press conference last Sunday called the fires the "new abnormal, and this new abnormal will continue in the next 10, 15, 20 years." "Unfortunately, the best science is telling us that dryness, warmth, drought, all those things, they're going to intensify," he said. Reacting to the outbreak of the recent spate of fires more than a week ago, Trump blamed environmentalists in the state, tweeting in part, "so many lives lost, all because of gross mismanagement of the forests." Some community leaders and legislators, as well as many fire victims, see other culprits: the public utilities and those in state government who they believe haven't done enough to protect against power lines snapping and igniting the blazes. Residents in the city of Paradise filed suit against PG&E in San Francisco Superior Court Tuesday, alleging that the utility company's negligence and faulty equipment generated the deadly Camp Fire. The plaintiff's attorneys claimed that a high-voltage transmission line failed, igniting surrounding vegetation. The cause has not been officially determined, but PG&E disclosed in a regulatory filing Tuesday that it "experienced an outage" on a transmitter line in Butte County at 6:15 a.m. on Nov. 8, minutes before the Camp Fire was reported. Additionally, Cal Fire, the state's Department of Forestry and Fire protection, has concluded that PG&E equipment sparked a series of destructive fires in 2017. The unanimous votes were preceded by a lengthy committee process involving several hearings and testimony from community leaders across the state worried that utilities weren't doing enough to "harden" their lines in fire-prone areas. "We did the bill at the request of the cities in my district, and we got it through the legislature, it went through three committees in the Senate, and we didn't have one vote of opposition so it was sort of a shock that it was vetoed," Moorlach told the Washington Free Beacon Thursday. "It was supposed to prevent fires in wildfire zones, and it's also a way to reduce greenhouse gases so we were surprised when the governor vetoed this bill." 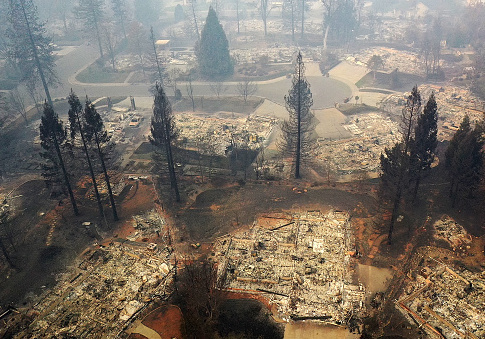 Moorlach said he expected Brown and Democrats focused on climate change to embrace his bill because some of the worst wildfires in the state produce as much greenhouse gases "as all the cars driving in California for a year." "It just seems like someone as committed to that cause as Jerry Brown would say, ‘Get it done tomorrow. It should have been done six years ago when I got here,'" Moorlach said. Asked about the veto, Brown's spokesman reiterated his veto message and referred the Free Beacon's questions to the CPUC. In that 2016 veto message, Brown said the bill was redundant because the CPUC was already prioritizing areas that have increased fire hazard associated with "overhead utility facilities." "This deliberative process should continue, and the issues this bill seeks to address should be raised in that forum," Brown said. The CPUC said a fire-threat map the 2016 measure called for was approved in January 2018 and argued that the Moorlach measure would have prolonged the safety work already going on by requiring the participation of "certain entities, which was unnecessary because Cal Fire was already a party to the proceeding, and local governments and fire departments could also participate." It also said that the CPUC and Cal Fire were already "deeply engaged" in ongoing fire safety rulemaking processes at the time Brown vetoed the legislation. Phase 1 of this effort began in 2013 and was completed in 2015. Phase 2 implemented new fire-safety regulations in high-priority areas of the state as called for in the vetoed legislation, "thus making the bill redundant." "In California, you have to manage the state through legislation—you have to tell the departments how and when to do their job or it can just get lost in the bureaucracy" and take years longer than necessary, he said. "Some deliberative process. What a sad joke. No maps. More greenhouse gases. More innocent lives lost, all because a governor who despises managing a bureaucracy, relied on that same bureaucracy and received what? Nothing?" Moorlach wrote in a blog post this week. "Now we have the Camp Fire," he added. Cal Fire found that the Tubbs Fire, as well as five other fires in a total of six counties, were caused by PG&E’s "electric power and distribution lines, conductors and the failure of power poles." Laguna Beach, an upscale city in Moorlach's district, experienced four fires in the last 10 years and at least 441 homes were lost to fire, the senator said. The all-Democrat city council is still concerned about the area’s vulnerability to utility-sparked fires. "If one of those poles falls down and the electric line snaps, it's a huge fire hazard," he said. This entry was posted in Issues and tagged California, Jerry Brown. Bookmark the permalink.